Licensed Lord of the Rings painting, " Expect Me When You See Me ! 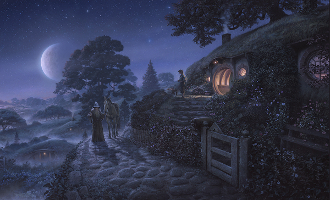 ", a scene of Bag End. Mixed media original acrylic painting on illustration board, was painted for my Lord of the Rings/Hobbit fine art program.